The zodiac sign of a person born on this day is Leo ♌ (The Lion) – a fixed sign with Fire as element. July 23 is the 204th day of 2019 and there are 161 days remaining until the end of the year. Tuesday is the day of the week. This is the 30th Tuesday this year. Famous Jul 23 birthday celebrants include Gloria DeHaven, Elly Annie Schneider, Lil' P-Nut, Philip Seymour Hoffman, Arthur Treacher, Michael McConnohie, Samantha Beckinsale, Reece Ritchie. 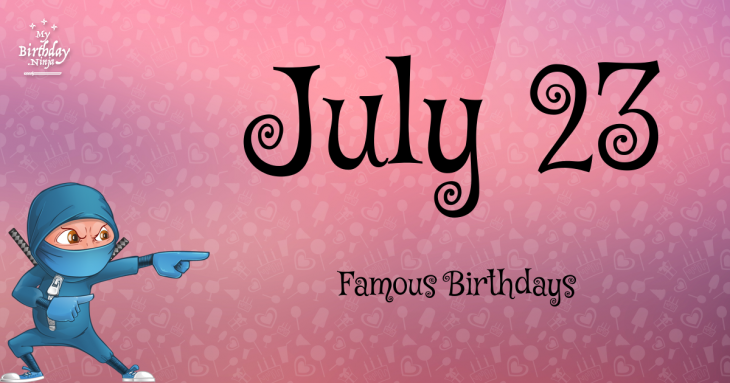 The following famous people celebrate their birthday on July 23rd. The list is arranged in chronological order and includes celebrities like actors, actresses, models, singers, rappers and producers. Click the after the name to explore the birth date info and know the meaning of their life path number. The epic list contains 244 persons. Showing 1 - 30.